Today is the second time I have participated in Career Day for the Santa Ana Unified School District. Last time it was a Villa Fundamental Middle School and this time it was at Douglas MacArthur Middle School. The first time I showed kids how they could code a super-basic web page using nothing more than a text editor for coding and a browser for checking their work. This time what I did was more adventurous: I installed WordPress Multisite site and created 40 individual so that 4 classes with an average of 35+ students could log in, write a blog, add images and learn how to link to a web site. It was a little bit of a logistical challenge getting everyone logged in with a complex user name and password and for them to navigate the Admin area of the site but all in all they did amazingly well. It was a very gratifying feeling to have it all go so well and the kids really seemed to enjoy it. 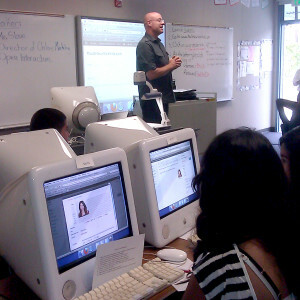 “Teacher for a Day” – Mr. Sloan leads the discussion of web development. The various posts show a wide variety of skill and interests. I tried to draw them out a little bit by asking what they wanted to study in college. Some people obviously took the task more seriously than did others. Some surprised me with what they could accomplish without additional instruction. Some of the background color and image changes indicate that the kids were in there trying things out on their own which is great. I also got to meet many interesting people from our local community. It was great to run into Dr. Sebastian Gonzales of P2Sportscare.com: what a super-active community member he and his family are! The last time I ran into Sebastian he was at the OC Marathon cheering the distance runners along of which I was one! The last time I ran into his Dad he was biking along the Santa Ana Riverbed near Huntington Beach. I also ran into an interesting guy, Kimo Morris who is a marine biologist from Santa Ana College and Anthony Mack and two more Googlers from the Irvine Campus of Google. Finally I met Tim Cully, an attorney from Huntington Beach. 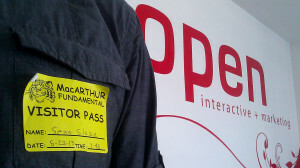 He was a very personable guy with a great self-taught knowledge of web technologies. We had a very nice conversation about his history with the web. Obviously another active, involved local business person interested in giving back to the community. I wish I had more time to meet and greet all the folks there! All in all it was a day well spent!